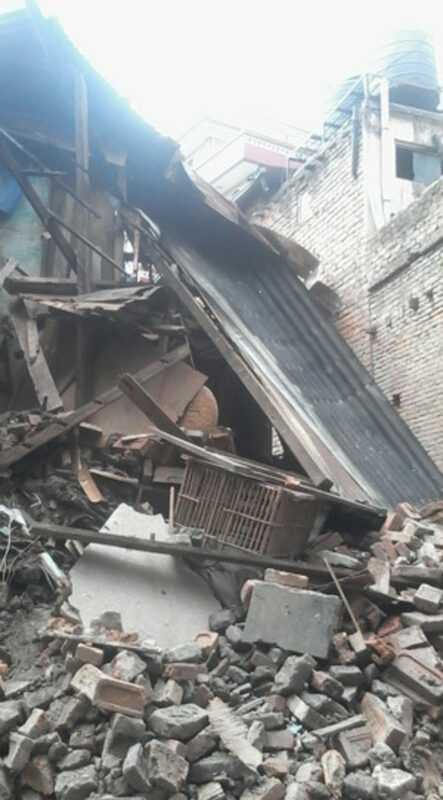 In the terrible Gorkha earthquake that hit Nepal on 25 April, over 7,000 people are now known to have been killed and hundreds of thousands made homeless. Many members of our Cicerone community will have lost friends and seen reports of devastation in places that they have long known and treasured. Two of our authors have been out there and wanted to share some of their experiences and ask us all to support the Nepalis today and in the coming trekking seasons. 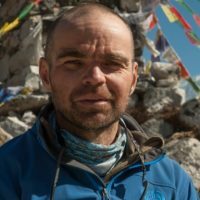 Radek Kucharski, (author of Trekking in Ladakh) was in Kathmandu when the quake struck just after completing the trek to Everest Base Camp where he was leading a group of Poles. We reached Kathmandu well before 10am on Saturday 25 April, looking forward to a shower, some sightseeing and an evening of live music and beer. By 11am we were in our hotel rooms in Thamel. I was in the shower when the earthquake struck. I grabbed a towel and quickly got under the bed – two tiny attempts at self-protection. The bed and the floor were shaking, a glass fell off the table and I could hear screams outside. I knew I had to leave as soon as the shaking stopped but I wasn’t sure the building would last that long. I dressed, grabbed my passport, money and small rucksack. Luckily I hadn’t had time to unpack so my polar fleece pullover and a down jacket were still there. My group was already outside when I joined them: one wearing just a towel, one half-shaven, hardly anyone with documents or any luggage. 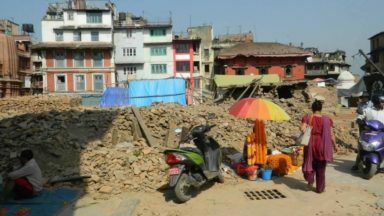 We were on a small square with a stupa during the first, very strong aftershocks. 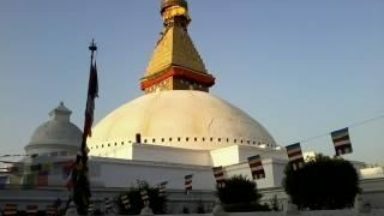 I knew the stupa had a connection with the Indian king Asoka so was old and had probably survived many earthquakes. But the tall buildings around us were not so solid – we had to move, but entering the narrow streets didn’t seem a great idea either. 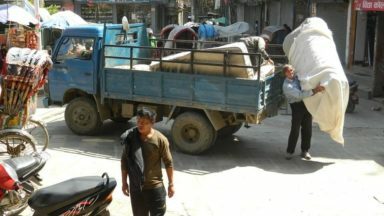 In the end, we slept in the open on a square in front of the Potala Guesthouse in Thamel, alongside many local people. A shop opened for a few hours each day, selling parathas and omelettes and a few guesthouses were letting us use their toilets. We had no electricity and only intermittent mobile phone coverage and so, with no way of finding out what was going on, we had to be constantly alert. After just a couple of nights we managed to leave for home again on a plane which had brought a rescue team from Poland. Only in India, later, about to lead another trip, with my Polish group safely home, did I realise how exhausted our brief experience had left me. So it was off to the Hotel Moonlight in Paknajol for a new experience. En route we dropped into Hotel Pilgrims and amazingly met Som Tamang, a recent acquaintance from Cairns. Sadly his brother was killed in the devastation of his village. It seems that the whole area of Helambu has seen its villages destroyed. 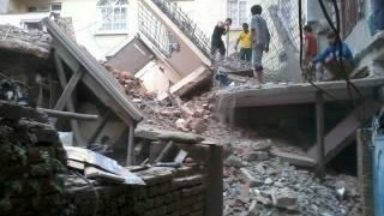 His 8 year-old niece fell from an upstairs window as the house crashed down, and sustained jaw injuries. Fortunately she is making a slow recovery, but the terrifying trauma of the moment remains. Luckily now many villages in that area can be accessed by rough dirt roads and hopefully some aid will eventually arrive. It seems most is brought in directly from Kathmandu by the relatives of the villagers. We checked in with Himalayan Map House, our publisher, and met Pawan. As luck would have it, a group of aid-working telecoms engineers were there looking for maps of Ganesh Himal and Langtang/Helambu. They had absolutely no idea of the terrain they expected to help. It seems they fully expected to be able to get into the hills to do some work by just turning up in Dhading, the roadhead, and hiring a couple of porters for a short walk to the villages... we directed them to the local trekking company, but if truth be known we doubt they will find porters or willing staff to go. The hills are devoid of local porters and youth, most working in the Gulf or Malaysia. It’s sad that so much energy from outside NGOs and armies of willing helpers cannot be harnessed in the tasks. 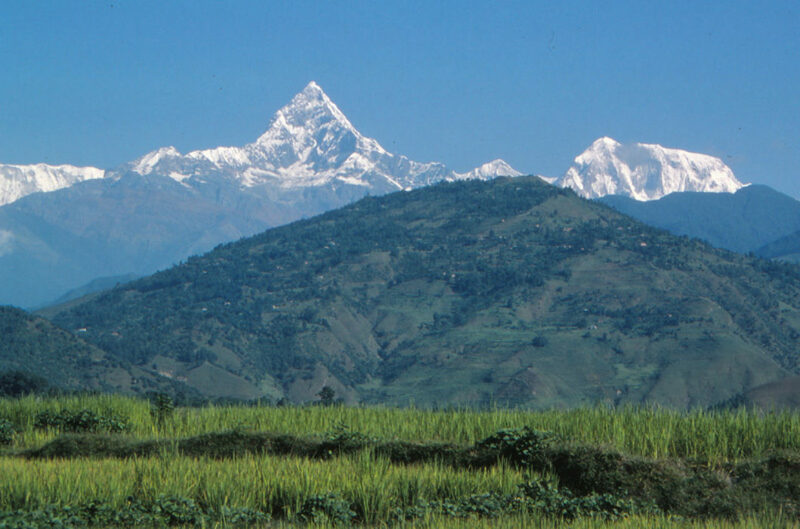 Nepal is not a country where just heading into the less well known countryside is a short stroll or remotely easy. 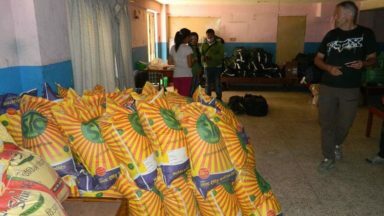 There are also reports of aid supplies heading further upcountry being looted by desperate villagers lower down, which means the higher settlements need to be accessed by helicopter, which are few in number. Similarly, some ugly scenes have been reported from Helambu. Anyone with bags of vital stuff is likely to be extremely popular but in danger of being rapidly relieved of their goods. It’s a staggeringly Herculean task that faces all who want or need to help. One of the most remote villages is Tipling, in the Ganesh Himal region, which we recently researched for our trekking guidebook. We met Beni Ghale and her brother desperately trying to work out how to get food, clothing and tarpaulins into the area. They spent all morning trying to get a helicopter, but the government now controls the movements of all rescue missions. We rushed off to the British Embassy to see if anything could be done, but it seems that such things are beyond their control. In any case the Nepal government has declared four days of mourning, so nothing is happening. Banks are not releasing any incoming aid funds during this period. We have been here less that 24hrs and already the frustrations that others have experienced are hitting us. At least some of our tarpaulins will see active service tonight in the rain and drizzle. But our efforts are such a pathetic drop in the ocean. What will the morning bring? 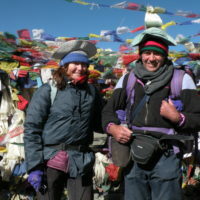 The quickest way for the trekking community to recover here is for trekkers to hold fire for a month or so and not to completely shun the coming autumn trek season. Having had no progress finding a helicopter to reach the Ganesh Himal village of Tipling yesterday, we tried a new tack and were recommended to go to Oxfam in Patan. En route to Patan we noted that a few of the older buildings have collapsed, including some temples, but in general little is down... most people have returned to their houses with only minor tremors continuing. About 700,000 have left the valley to return to their villages. Many shops remain shut as restaurant staff, hotel staff and the like are gone. Together with Beni from Tipling we met with the extremely helpful Oxfam area co-ordinator to find how the system of distribution works. Apparently all aid is directed to the local CDO, the district office basically, and they decide which areas are the priority and where any aid stuff will go. The various NGOs are then allocated areas within the main zone. In this case it’s called the Dhading zone. The Oxfam co-ordinator arrived for the first time in Nepal on Tuesday last week and had never been to the country before, so we at least could give him some insights into the country. One can image what we were discussing and how we expected aid supplies to be distributed ‘equally’ around this multi-party dominated zone. The remote villages are sure to be beyond the radar of town-based administrators in Dhading town. The man from Oxfam is trying to co-ordinate all the various affected areas across Nepal, so it’s a mammoth task, especially as he is not familiar with the terrain or the culture. We are not sure if they had any decent maps in the building, and during discussions we relied only on our Nepal Himalaya guidebook to explain the geography. At the conclusion of the meeting we held some hope that a helicopter will be assigned to the area very soon, but as usual its timing is not assured. ... Later Beni also managed to find a private helicopter, but its capacity is a mere 400kg. It might depart tomorrow with basic food and maybe some of our tarpaulins if weight permits. After the action yesterday we are taking a break this morning, waiting to hear from the tarpaulin man who wants to remain in the shadows. He messaged later to say there are no deliveries today, so we must wait until tomorrow. According to one small charity, some tarpaulins are being held by a large worldwide charity (not Oxfam) for reasons described as ‘waiting for an emergency’!! 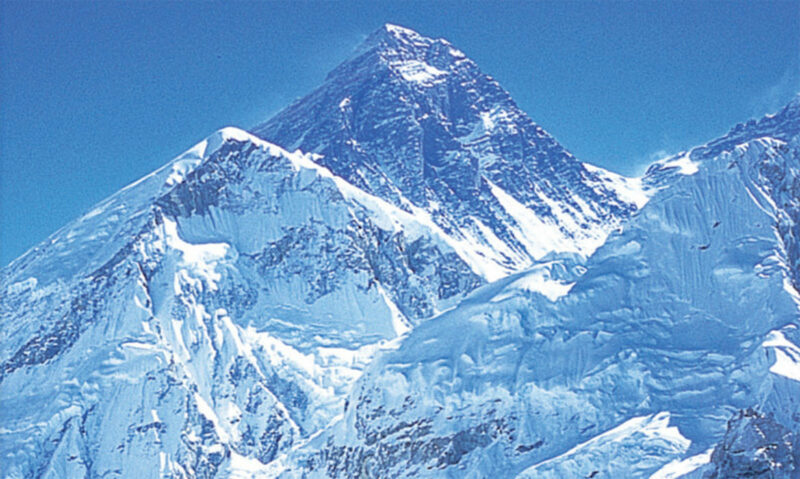 The story of the Everest disaster is well known by now, but like last year the recriminations are starting to fly again... Damien flew down from Gorakshep in a small helicopter with a few others, because his insurance company insisted it was still dangerous in the upper Khumbu. It is staggering to think that these vital helicopters are being used for recreational ‘rescues’ at this time. Apparently the companies are permitted to do 2 or 3 hours of private work a day, so we can’t complain about that since they are working very hard for the rest of the day on government causes. Still no news about the helicopter request for Tipling village today. A returning trekker tells us that a private helicopter flew in empty to the Everest Khumbu area to take out an uninjured trekker who was feeling bored with his trek. Commercial flights are now running to Lukla. Two weeks have now passed. International rescue teams are working in Nepal, foreign aid from individuals and NGOs is flowing to the country. I hope we will stand with Nepal not only now but in upcoming months and years, when Nepal will no longer occupy the front pages of the newspapers. Nepalis depend on tourism to a vast extent: all the thousands of guides, porters, guesthouse, hotel and lodge owners and their staff, people working in restaurants and bars, musicians playing every night in pubs of Kathmandu and Pokhara, shopkeepers, drivers. They and their families depend on the incomes that tourism has provided for so long. And Nepal has not ceased to be the home of the highest mountains in the world, a country of fantastic landscapes and boundless trekking and mountaineering options. It has not ceased to be a place of fascinating monuments, even though some have now been reduced to rubble. It still has Chitwan National Park with its crocodiles, gharials, tigers, wild elephants and Indian rhinoceroses. And it is a country of joyful, hospitable, smiling people who make visiting their country such a pleasant experience, people of a land that was never easy to live in, people who need our support – not only for the money they need now and will need in the future, but ­– more importantly – the support we will give by being with them. Work will be the major means of returning to ‘normality’ and we can give it to them. Don’t forget Nepal when it is no longer on the front page of your newspaper. Don't forget Nepal as you plan your holidays. Bear it in mind for a climbing or mountaineering trip in the autumm or next spring. Keep doing what you can for our Nepali friends. 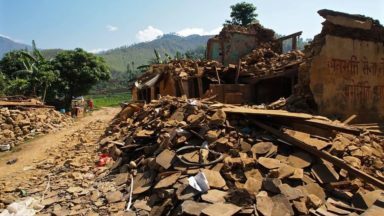 If you feel moved, (like us at Cicerone), to make a financial donation to help Nepal get back on its feet, this Cicerone blog post has information on how you can help.